95 Nm (70 lb-ft) @ 7500 rpm. The power/torque values indicated are measured using an engine dynamometer according to homologation regulation and they correspond to the homologated data, as quoted in the Bike Registration Document. Magneti Marelli electronic fuel injection system. Throttle bodies with full Ride by Wire system. 2 x 320 mm semi-floating discs, radially mounted Brembo monobloc callipers, 4-piston 2-pad, axial pump with adjustable lever, with Bosch ABS as standard. 245 mm disc, 2-piston calliper, with Bosch ABS as standard. LCD display with Dot Matrix area. 181 kg (399 lb). Weight data refers to the dry weight of the motorcycle without battery, lubricants and coolants for liquid-cooled models. 204 kg (450 lb). Kerb weights indicate total bike weight with all operating consumable liquids and a fuel tank filled to 90% of capacity (as per EC standard 93/93). 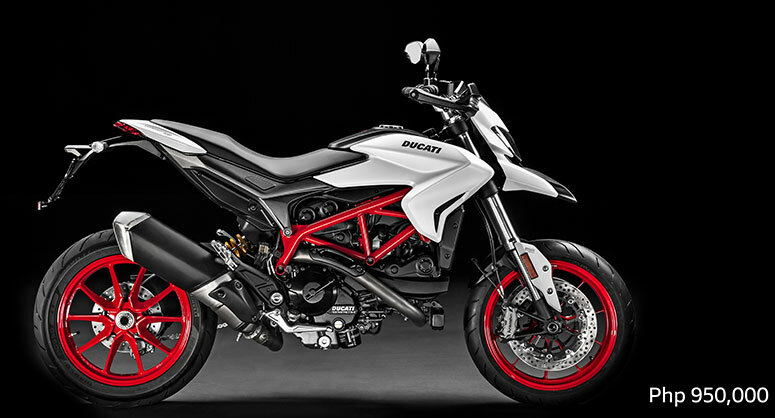 The new Hypermotard 939 family utilizes a 4-valve engine with a water-cooled cylinder, featuring a bore x stroke of 94 mm x 67.5 mm designed to achieve a perfect balance between usability and performance: this is the new 937 cc Testastretta 11° engine which provides maximum power of 110 hp @ 9,000 rpm and torque of 95 Nm @ 7,500 rpm.